With the busy holiday marketing season in full swing, Experian Marketing Services has released its online retail round-up for the week ending December 8. The online traffic to the top 500 retail sites increased 5% for the period of December 2 – 8, compared to the same week in 2011. 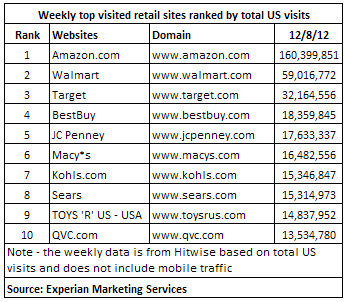 We will continue to publish weekly retail site data and insights through this holiday season. Please leave us a comment below if you have any specific questions along the way.